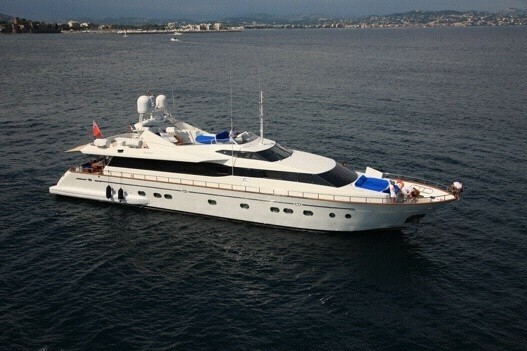 Luxury Mediterranean based motor yacht BOJANGLES is a 30,70m (100' 8") motor yacht built in 2004 by Falcon yachts. 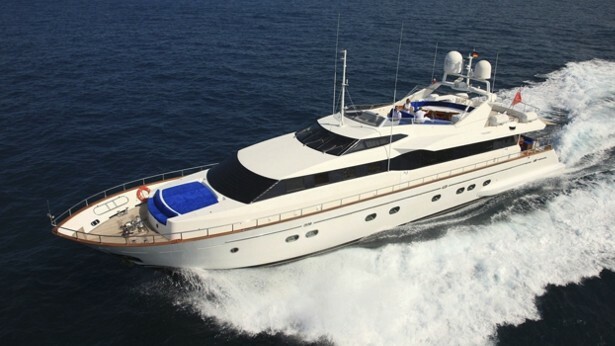 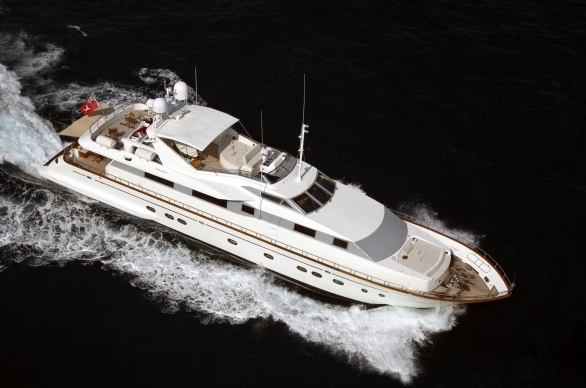 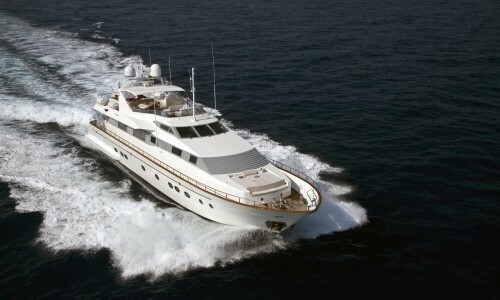 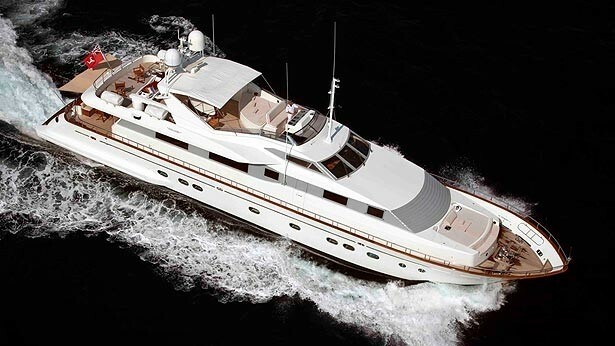 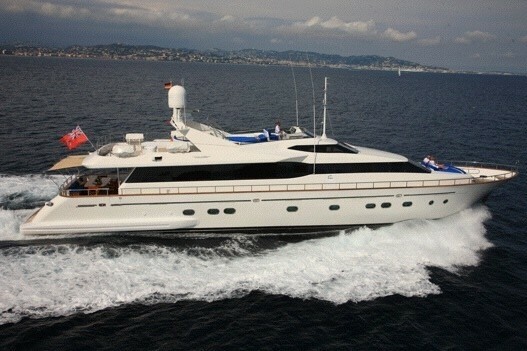 She is consistently upgraded by professional crew and she also received a mini refit in 2008. 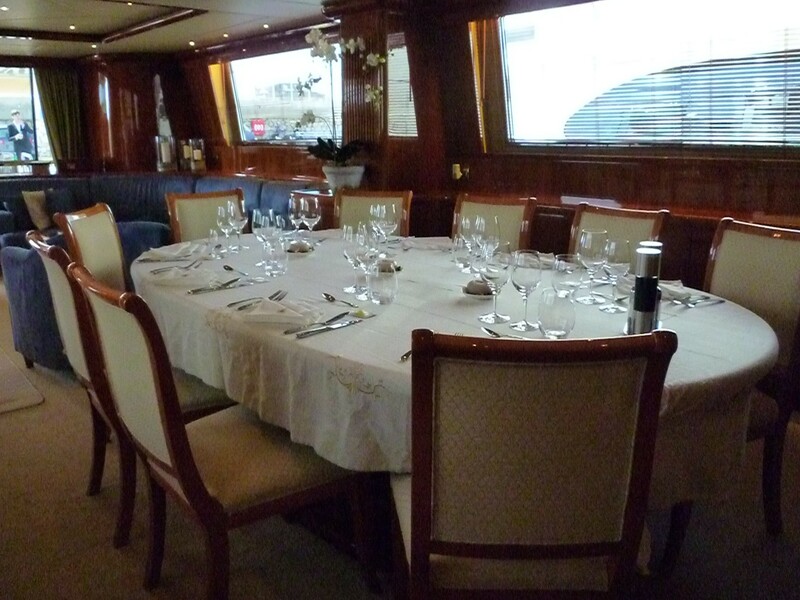 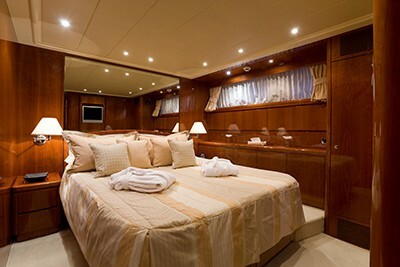 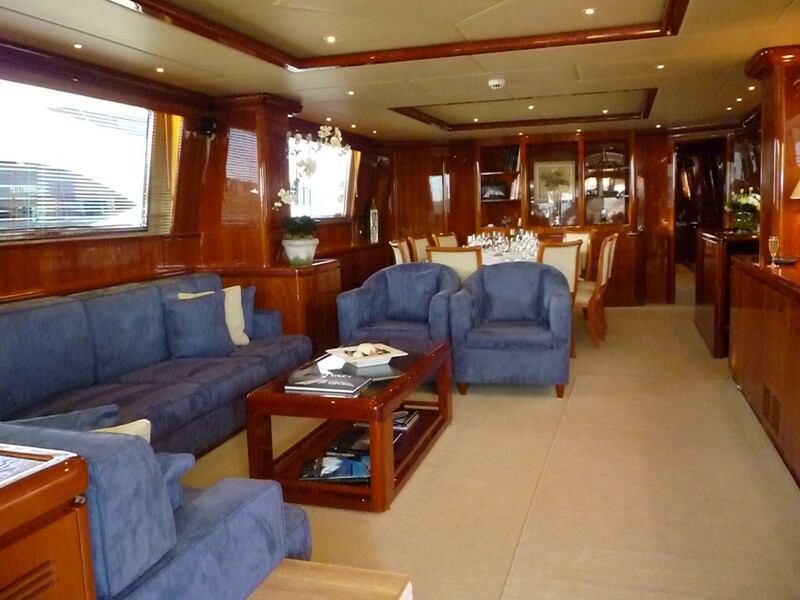 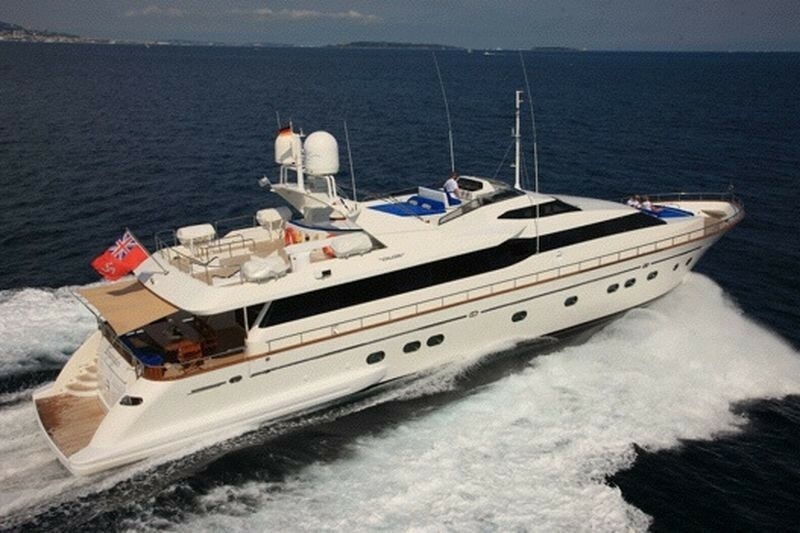 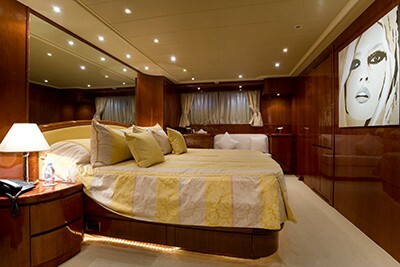 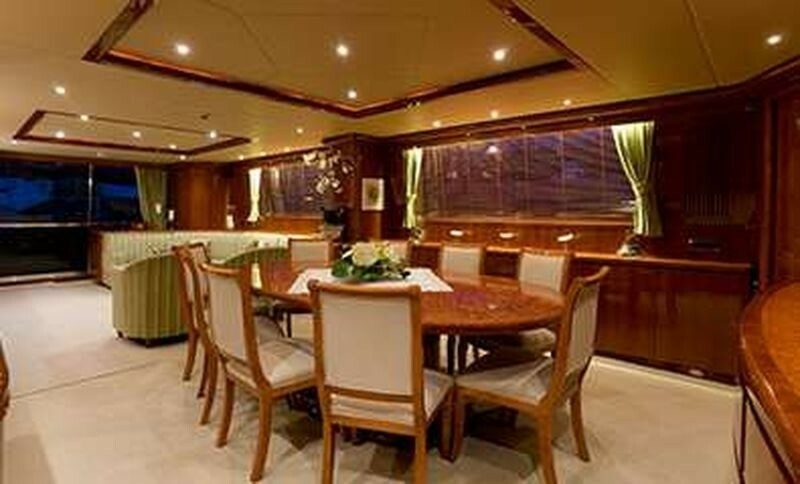 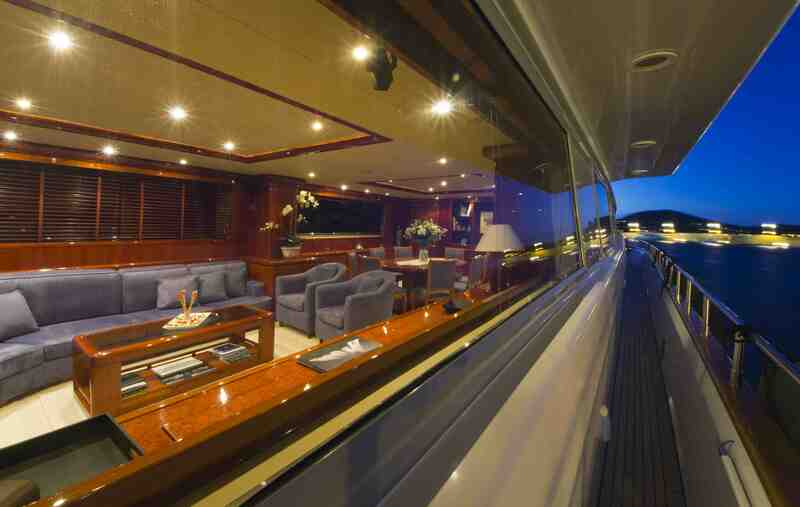 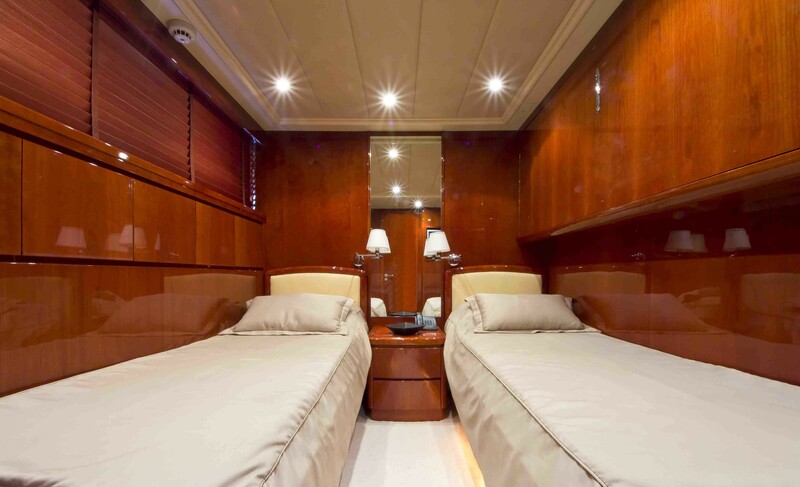 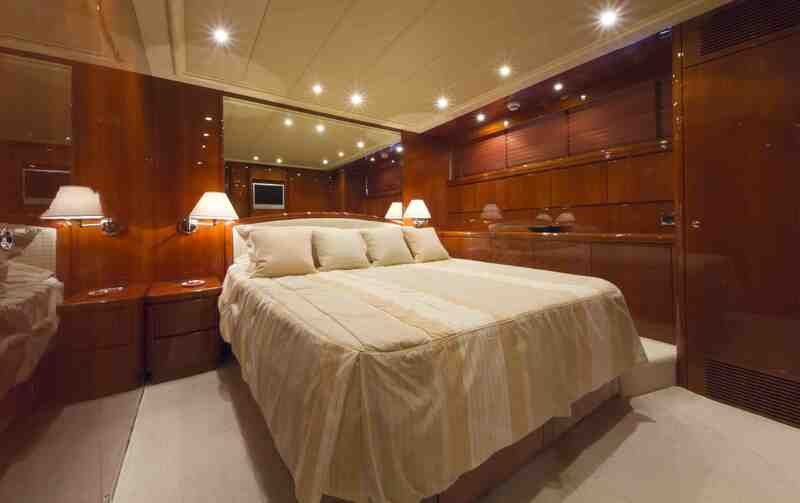 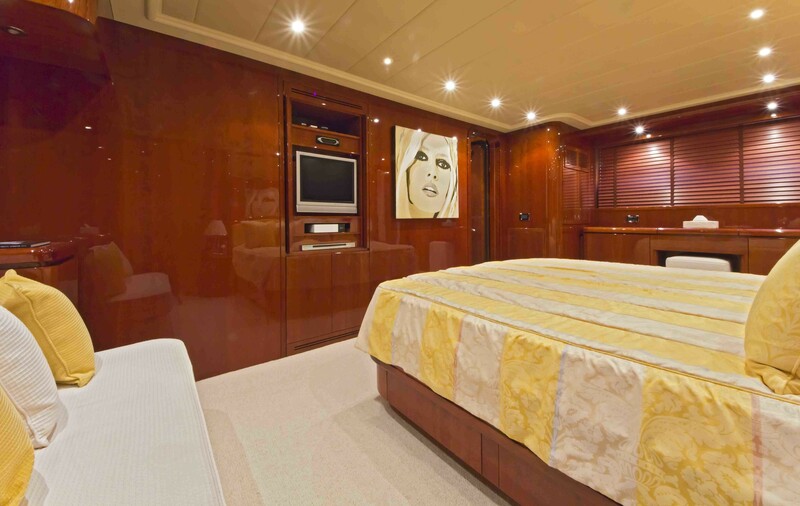 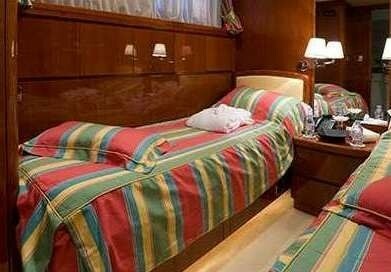 The yacht can accommodate up to 10 guests in 2 double and 2 twins plus a convertible TV room / double cabin. 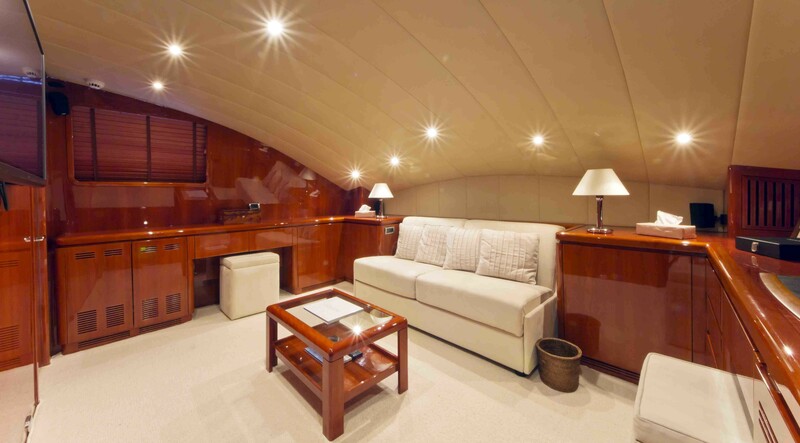 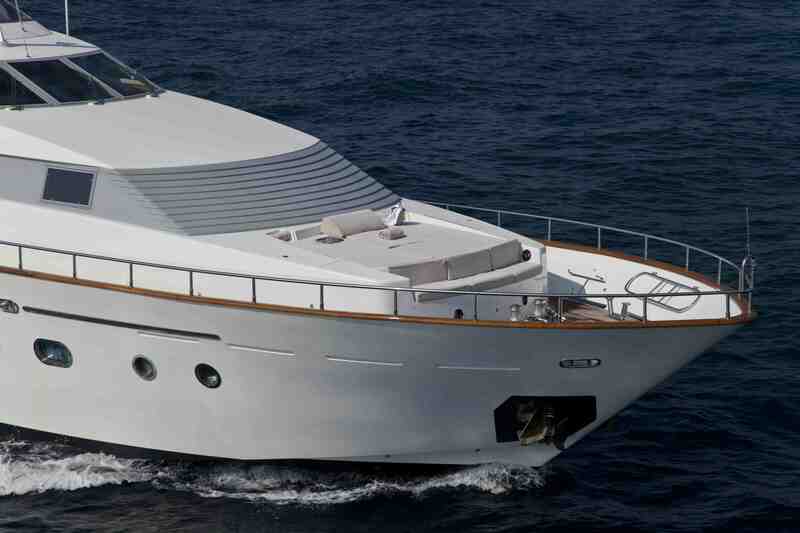 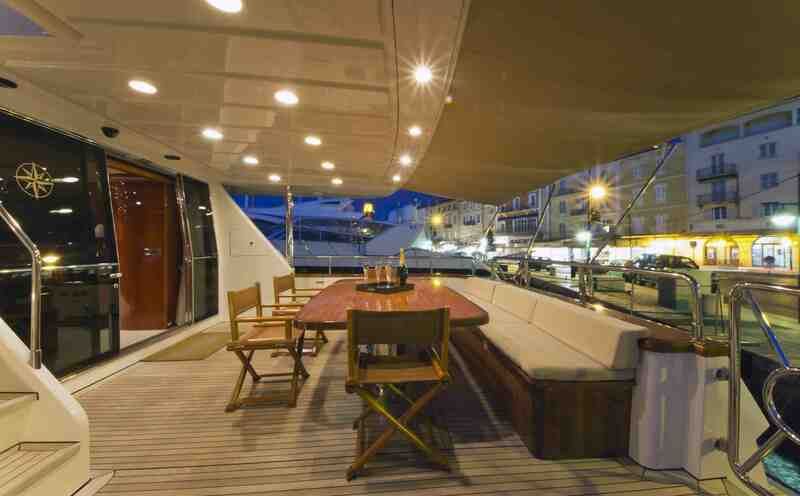 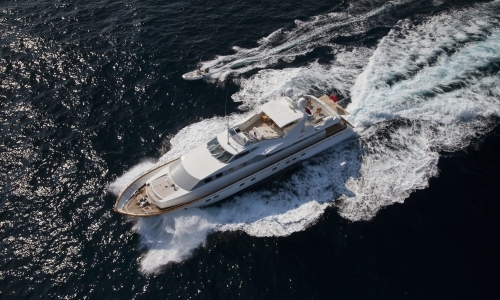 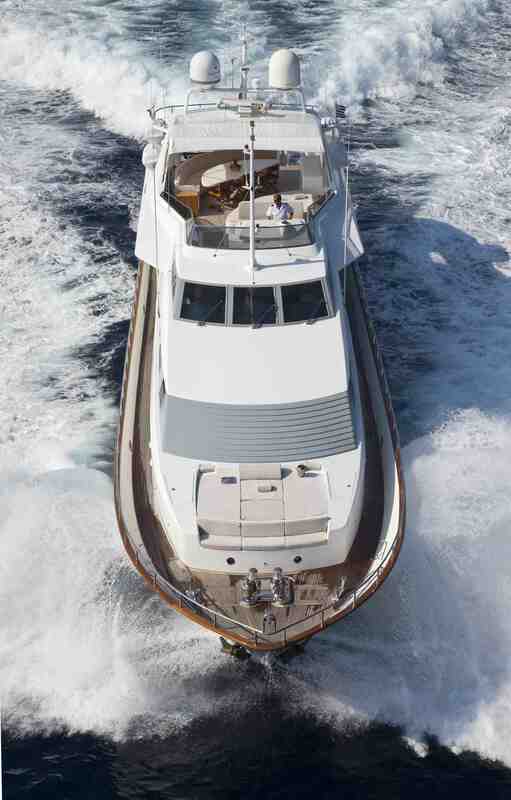 BOJANGLES was designed and constructed by Falcon Yachts, Italy, made from GRP and teak decks. 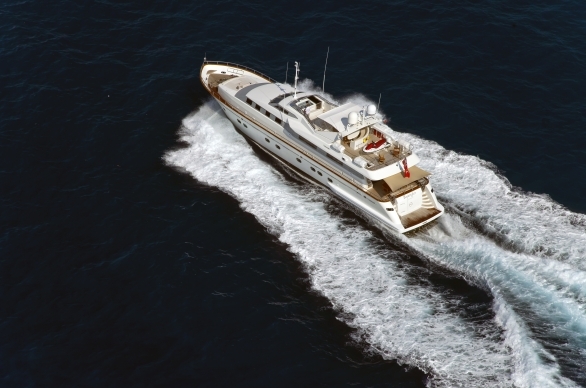 She has a fast planning hull design and can reach speeds of around 20-26 knots. 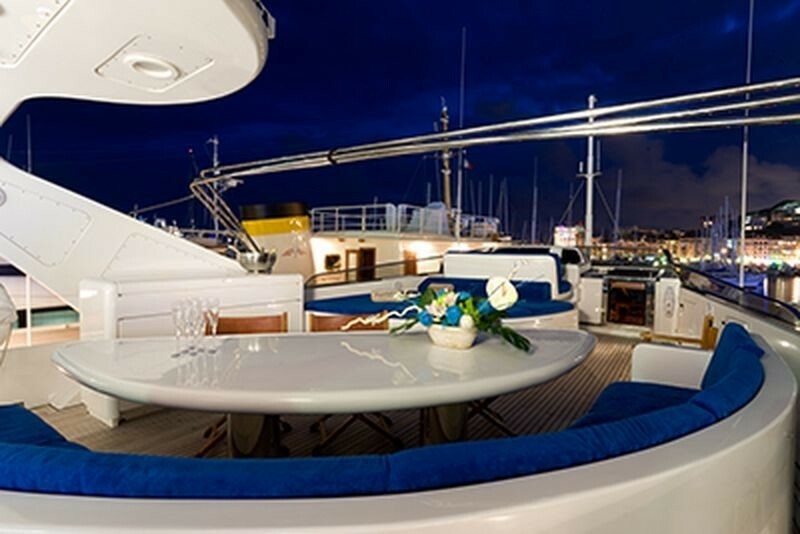 BOJANGLES has a large bathing platform with easy access to the water, a great aft deck for el fresco dining and a fantastic sundeck with huge sun pads and more el fresco dining options. 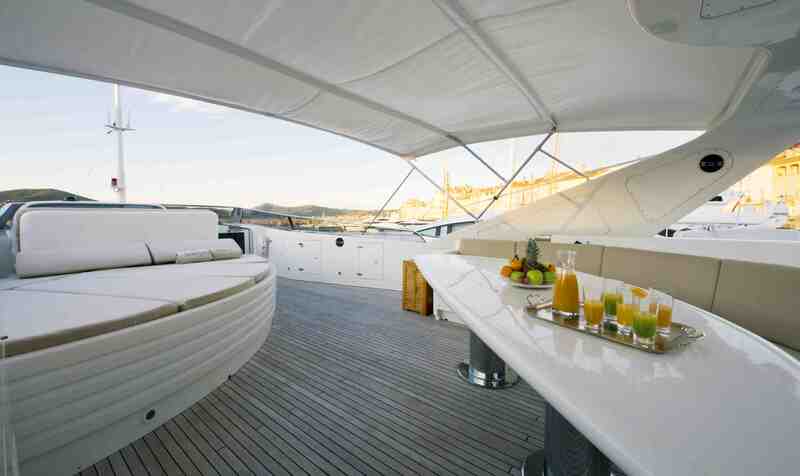 The sundeck is also equipped with an exterior helm station meaning the Captain can drive from here. 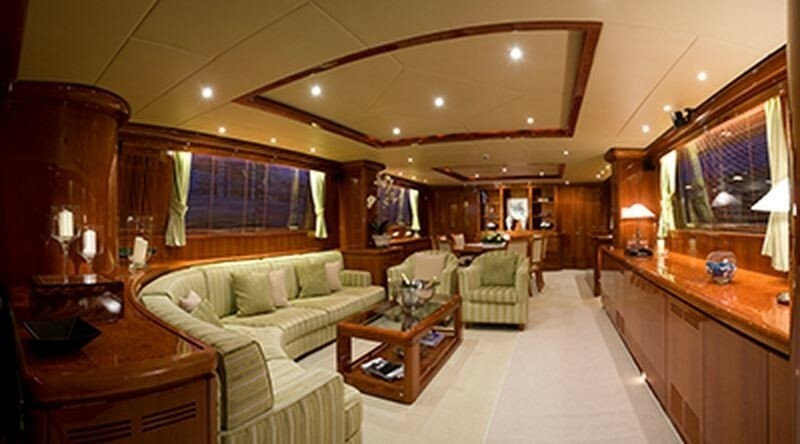 BOJANGELS is consistently upgraded by professional crew. 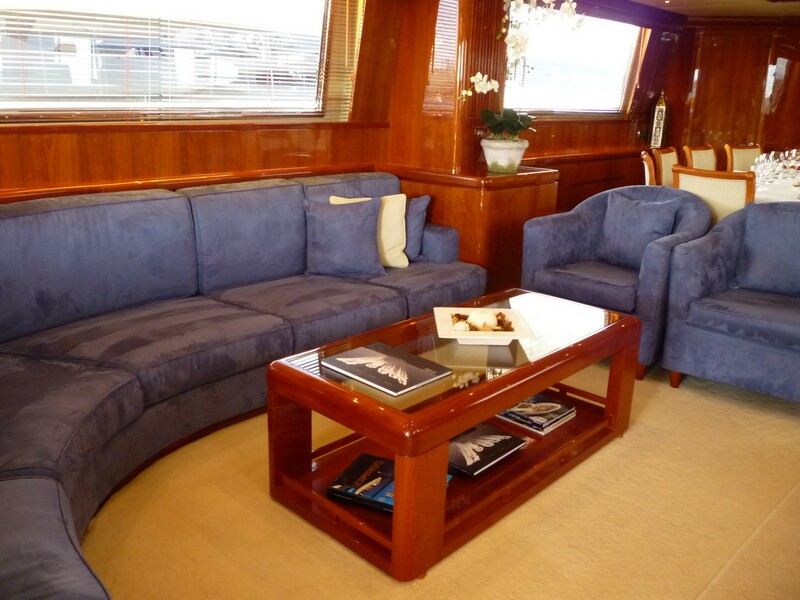 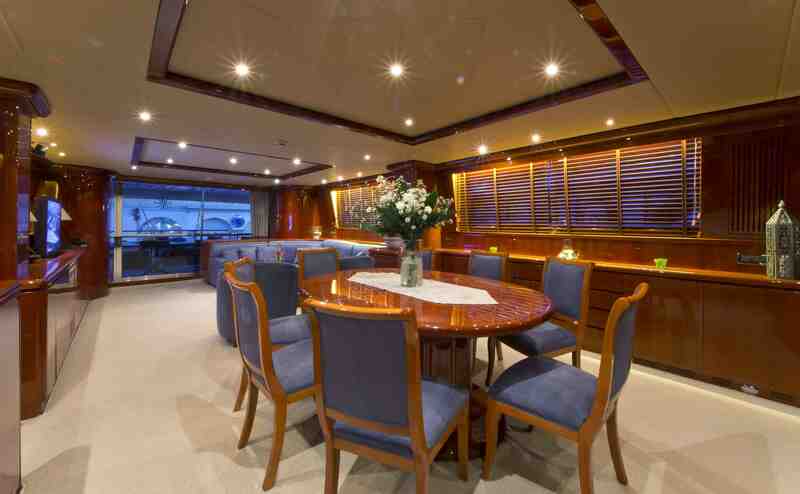 In 2008 she received a new teak aft deck dining table, a new sunbathing area, towels and cushions and a new convertible sofa in the main deck TV saloon. 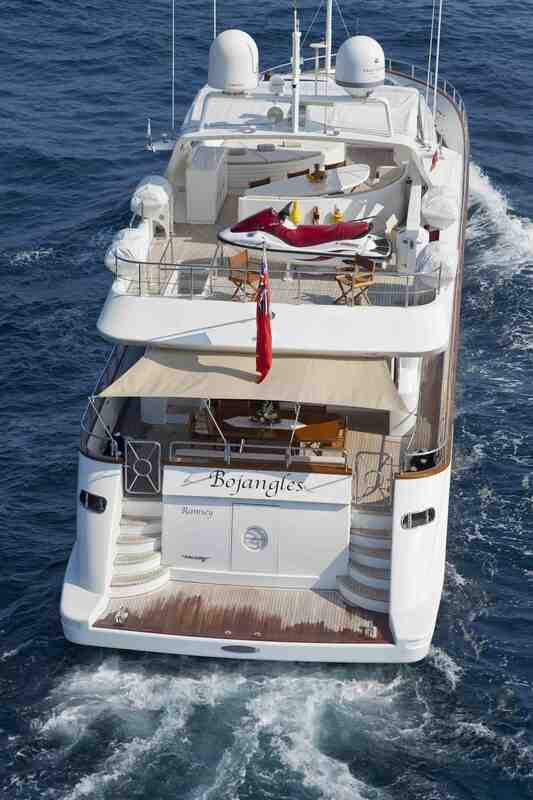 Bojangles has a warm and friendly crew of 5 ready to welcome you on board. 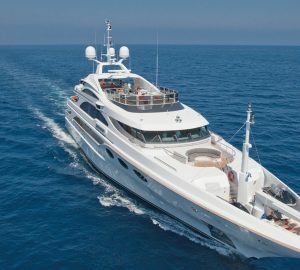 Motor yacht BOJANGLES can accommodate a total of 10 guests in 2 double bedded cabins, 2 twin-bedded cabin, and a 5th convertible double-bedded cabin / cinema fwd on the main deck – with a 140 cm x 200 cm bed. 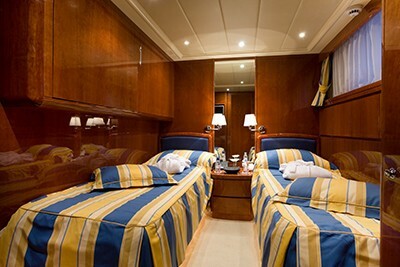 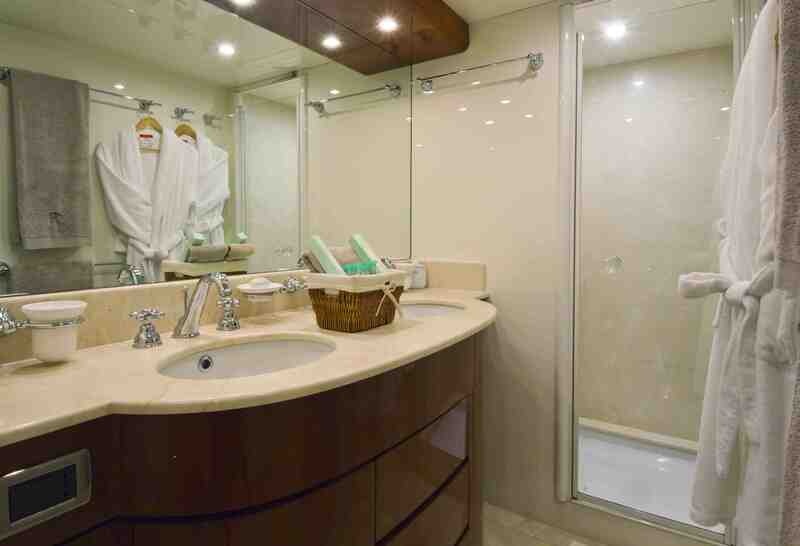 (The 5th cabin can be seen in the photos below) All cabins have their own ensuite facilities. 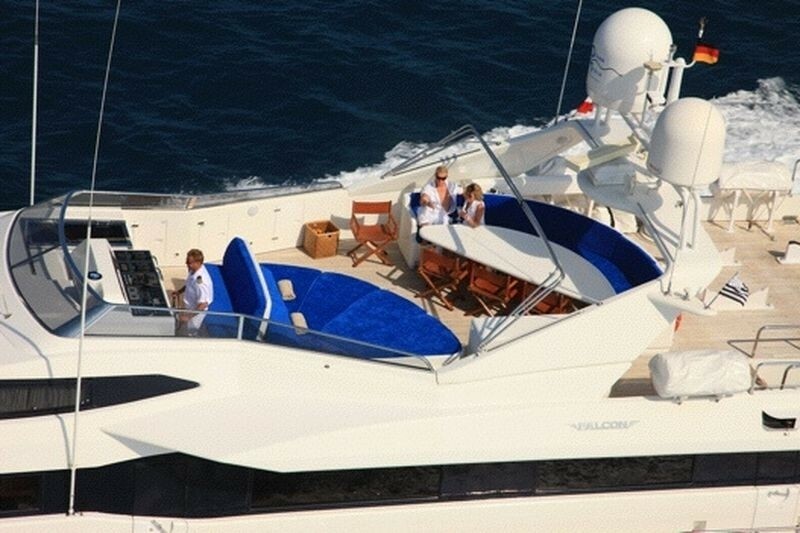 The crew are accommodated separately. 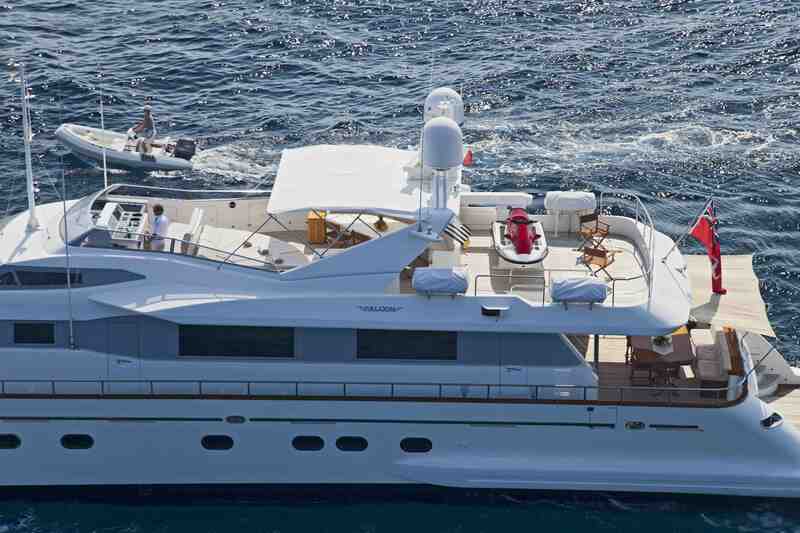 Luxury Falcon motor yacht BOJANGLES has a impressive range of tenders and toys including a 430 DL Novurania with a 60 hp Yamaha 4 strokes, a Kawasaki 900 STX, a 3 seater Jetski, snorkelling gear and inflatable toys. 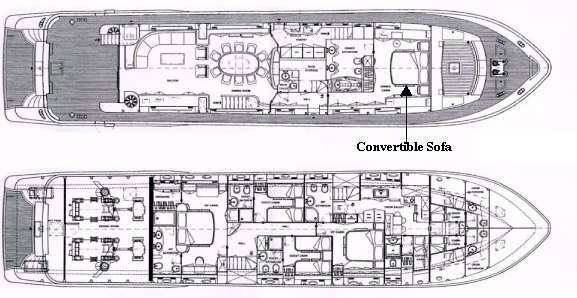 Communications onboard include 2 Sailor VHF’s, a Mini M phone, a Sailor SSB, a Sailor Sat C, Fleet 77 Sat. 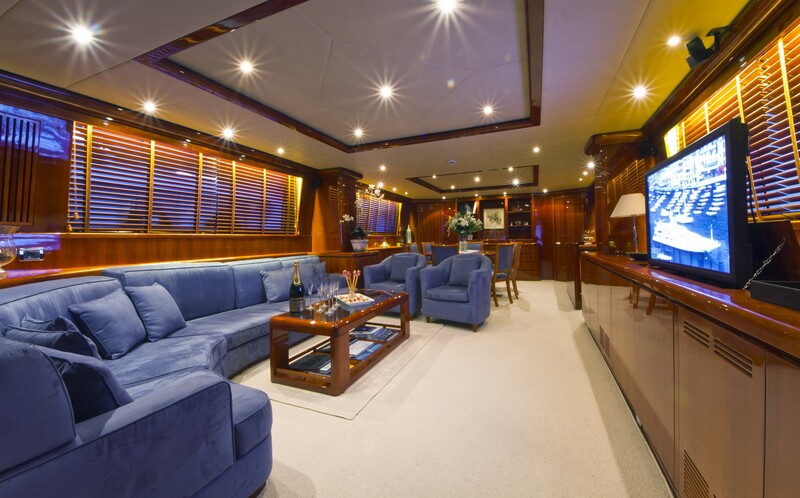 phone and internet, two emergency VHF handhelds, Satcom Nera mini M with Fax copier and scan machine, Pabx telephone exchange with internal phones connected, Fixed GSM telephone with 8w antenna, Fleet 77 for internet connection, Intercom. 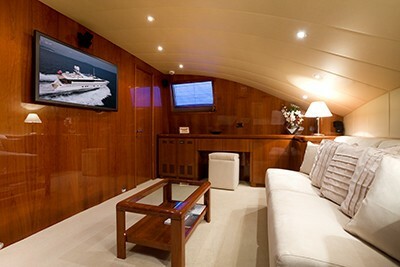 BOJANGLE’s Audio Visual Equipment and Deck Facilities include two Bose Surround sound units, De Zoned DVD players in all cabins and sky + boxes, 42' Plasma TV in saloon with up and down mechanism, Sat TV system Seatel with decoders in saloon, all guest cabins and crew mess, a 20” or 15” LCD TV’s in all guests cabins and crew mess, a Bose Lifestyle 25 as the Hifi System, fitted in saloon with 5 speakers and subwoofer and connected to TV system, Sky decoders, and an Ipod connection and 3 Ipod with audiotech.